Hearty Farro and Lentil Vegetable Soup. Welcome to this recipe. Here’s some hot hot info on cooking with parmesan rind. If you buy parmesan cheese “the old-fashioned way,” a.k.a. you buy a real hunk of cheese and not the pre-shredded or grated stuff, you MUST start saving the rinds in the freezer. I keep a little plastic bag in the door of my freezer for them, because they’re an amazing ingredient. Cheese rind has all the same flavor as the cheese itself, so when I’m making a soup or a sauce, I throw in one (or three) bits of parmesan rind during the simmer stage and let all that parmesan-ness permeate into the dish while it cooks. It’s an amazing flavor trick AND it recycles something you would have otherwise thrown away. And given the beautiful plant-based nature of this soup, you might as well offset a bit of the damage your cheese (i.e. a cattle product) ingredient inflicts on the earth by recycling part of it! In a large stock pot, heat butter or olive oil over medium low and add onion, zucchini, and garlic. Cook until starting to soften, about 2-3 minutes. Stir in tomatoes and cook until veggies start to soften. Add turmeric, cumin, salt, and pepper, and stir. Cook about 2 minutes until the spices are fragrant. Stir in the stock and bay leaf and bring to a boil. Once boiling, add farro and lentils. Bring back to a boil, turn down to a simmer, and partially cover the pot. Simmer, stirring occasionally, until the lentils are just tender and the farro is cooked but still chewy. Add the kale and cook just until softened, only a few minutes. Turn off the heat. Remove bay leaf and fish out the melted parmesan rind bits. Mandatory: serve with a drizzle of good quality olive oil. Actually, “drizzle” is far too dainty a word for the amount of olive oil I add when I eat this soup. Some kind of magic happens when all those flavors get together. Enjoy. I’ve become obsessed with these chickpea flatbreads. Lately I’ve been making them every week, because they go with everything and are so good. They’re the basis of a breakfast tostada-like thing I make on weekends, a great addition to a curry chicken and cauliflower rice work lunch, and I’ve even tried to make them into a quesadilla for dinner (with mixed results). They’re also very forgiving–it’s tough to overcook them–and have so few ingredients, I can barely call this a recipe. But a recipe it is, and such a versatile one. Chickpea flatbreads are quickly becoming one of my go-tos and I’m not mad about it. Pour the chickpea flour into a mixing bowl, and slowly whisk in the cold water, stirring to break up any lumps. Once you’ve added all the water and the batter is completely combined, use a slotted spoon to skim off any foam that has risen to the top. Get rid of that foam! Your digestive system will thank you later. Set the de-foamed batter aside on the counter to soak overnight (or for at least 6 hours). A note on soaking: I’ve made the flatbreads after waiting only 3 hours, and while they still turn out delicious, they are also a lot harder on your digestive system (remember that rhyme about beans?). So I soak the batter overnight at a minimum. 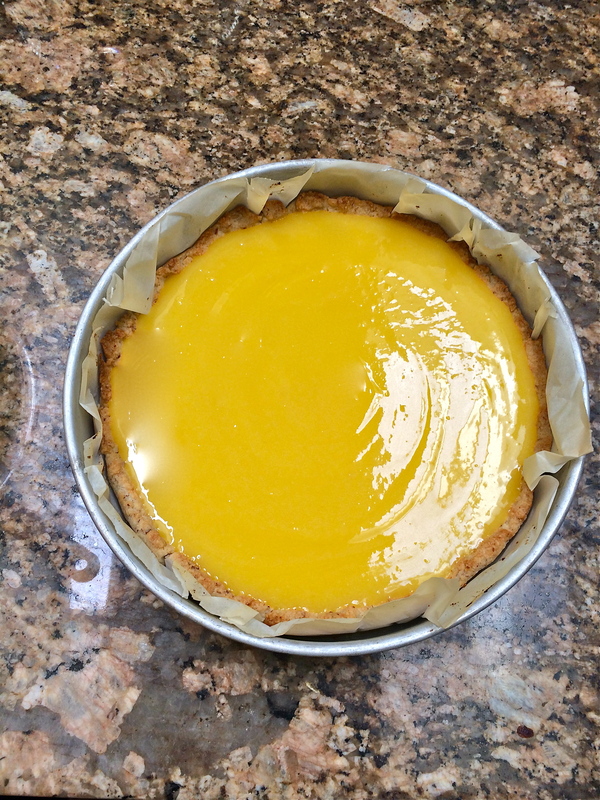 Once the batter has soaked, use a slotted spoon again to skim off any foam/impurities that rise to the top. Then give the batter a good stir to make sure it’s well-combined, and you’re ready to make some flatbreads! Heat a crepe pan or other non-stick surface over a low flame (2 out of 10 on my stove) and add a good amount of olive oil to the pan – not so much that you completely cover the bottom of the pan, but more than you’d use to just grease it. 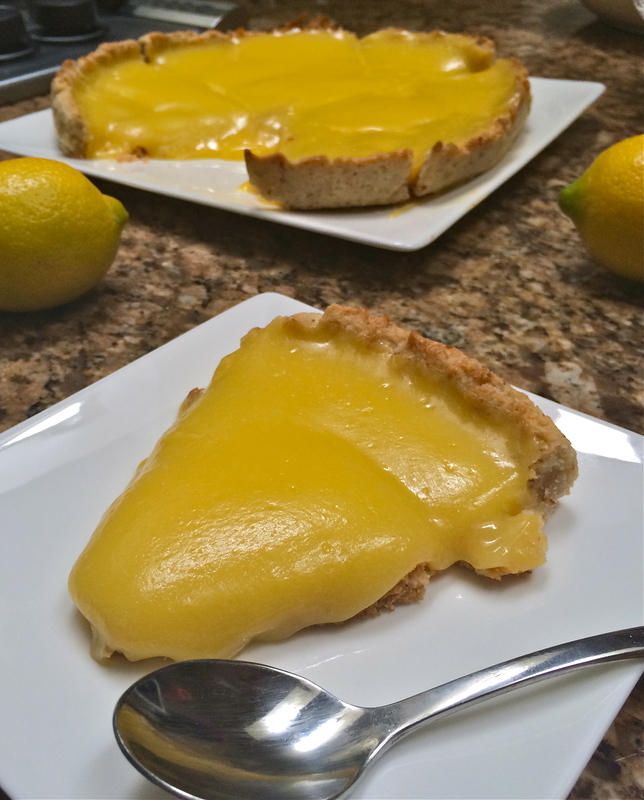 The olive oil is a fantastic flavor in this recipe, so you really do want to taste it. Once the pan is hot, you’re ready to add your batter. The amount you add will depend on the size of your pan: I use about 1 cup of batter, which covers the entire pan so that you can’t see the bottom–thicker than a crepe. Pour it in, add salt and pepper to taste, and let cook undisturbed for about 10 minutes. Once the batter is set on top, turn up the heat to medium/medium low (4-5 out of 10 on my stove) for 2 minutes to brown the bottom. Flip the flatbread over and cook the other side for another 8 minutes or so, until both sides are browned and the flatbread is cooked through. That’s it! I prefer to serve these right away, with some melted cheese, salsa, and eggs. Or you can let them cool, cut them up into quarters, and serve later. These heat up fine in the microwave, but they’re best reheated on a skillet. Usually I make one at a time, and I keep the rest of the batter in the fridge to make later (up to a week after first mixing it). Kale Salad with Pistachios and Roasted Cauliflower. Fancy breakfast side. Favorite work lunch. Quick and easy dinner. This salad has everything going for it even before I tell you how healthy and and wholesome it is (and it is healthy and wholesome). The dressing has all the things a good dressing should. Lemon and oil, sweet honey and tangy mustard, and a bit of seasoning are beautifully simple tossed with kale. The cauliflower makes it interesting and a little “meatier,” and with a good sprinkle of pistachios, things are starting to look downright fancy! I love this as an accompaniment to frittata on my weekend mornings (check the bottom photo! ), and it’s an office lunch I actually look forward to. And since it’s normal to be out of an ingredient or two, I love riffing on the dressing using whatever I have around (no lemon? Try white wine vinegar. No pistachios? Almonds are great, too.). What I’m saying is, it tastes amazing, is good for you, and you can eat it for every meal. Make it. Make it today. I like to start with the dressing; the longer those flavors have to come together, the better it will taste. Combine olive oil, lemon juice, mustard, honey, garlic, salt, and pepper, and stir together. Add the cheese and gently stir it in. Set aside. Toss the cauliflower in the olive oil, salt, pepper, garlic, and cayenne until evenly coated. Spread on a baking sheet in a single layer and roast about 25 minutes, stirring halfway through. It’s done when the florets are soft and just toasty-brown. Let it cool to room temperature before using. While the cauliflower is roasting, I use this time to de-shell and chop the pistachios. The final step is assembly. Toss the kale in the dressing, taste, and adjust seasonings if needed. Add the pistachios, and top with cauliflower. Serve as a side or as the main event. Enjoy! 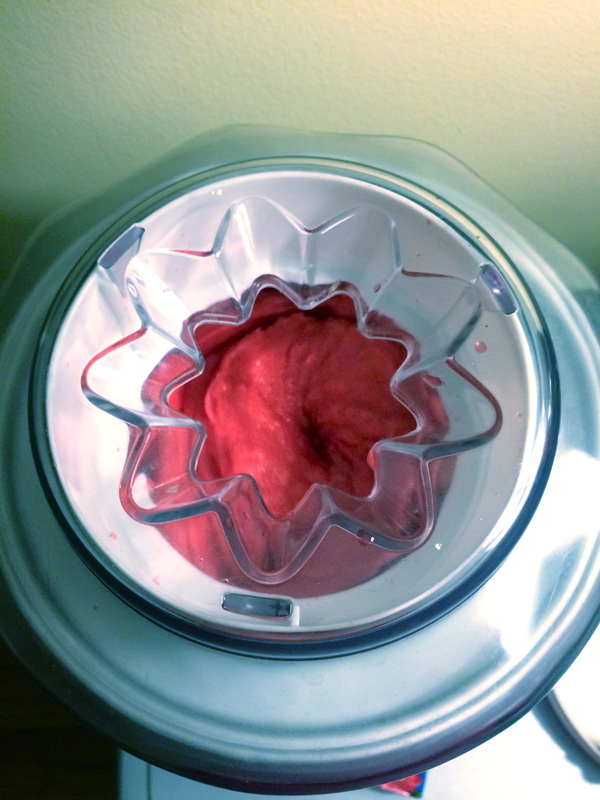 Raaaaaspberry sorbet. The kind you find in a secondhand store. For me, raspberries are about as good as berries get. I rank them at the very berry top, the pinnacle of berry perfection. 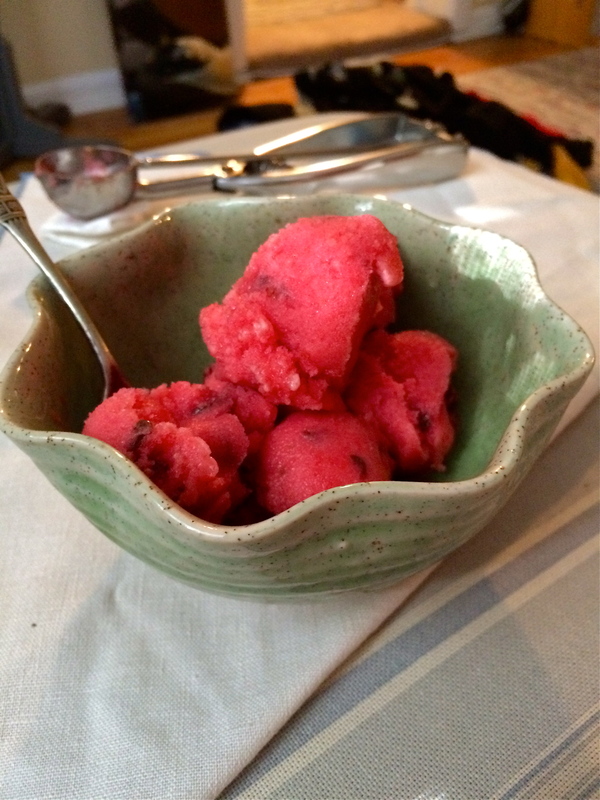 So, of course, my first use of my ice cream maker this season had to be raspberry. Their vibrant fruity flavor is the star here, and they’re so sweet on their own that this recipe doesn’t need much added sugar. Which is exactly how I like it. I mean, if you add minimal sugar, that gives you free rein to add all the chocolate chunks you want! 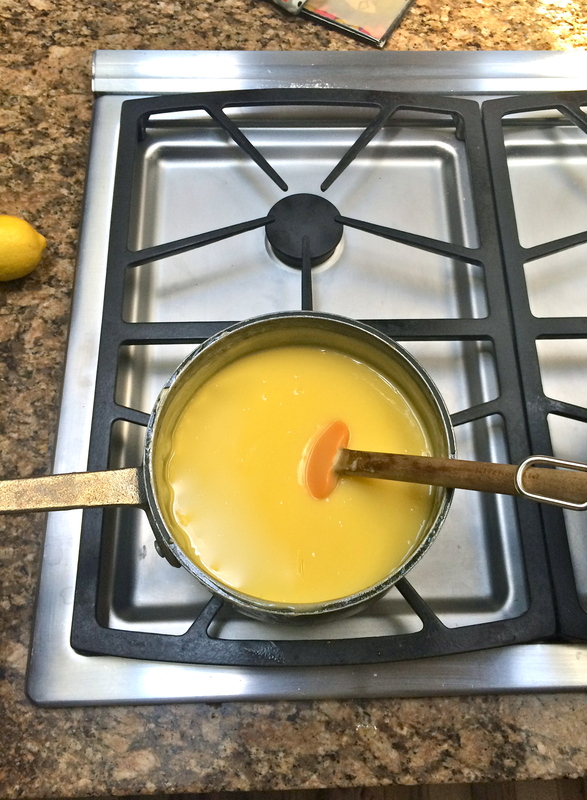 If you’re using sugar and not agave nectar, start by combining the water and sugar in a saucepan over high heat. Bring to a boil, then turn down and simmer for 5 minutes. 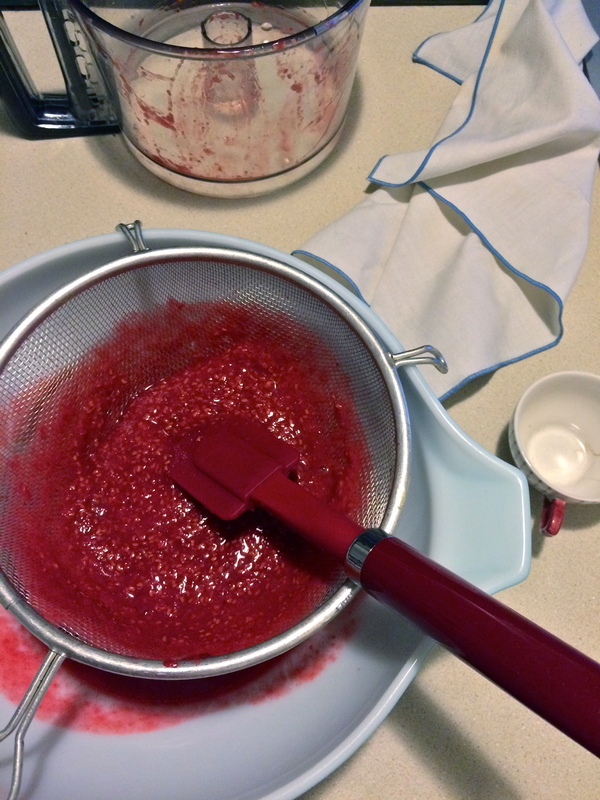 In a food processor or blender, blitz the raspberries, lemon juice, and vanilla. Pour mixture through a mesh strainer into a large bowl. Stir in the sugar syrup or the agave nctar and refrigerate at least 30 minutes (the longer the better). When the mixture has cooled, churn it according to your ice cream maker’s instructions. 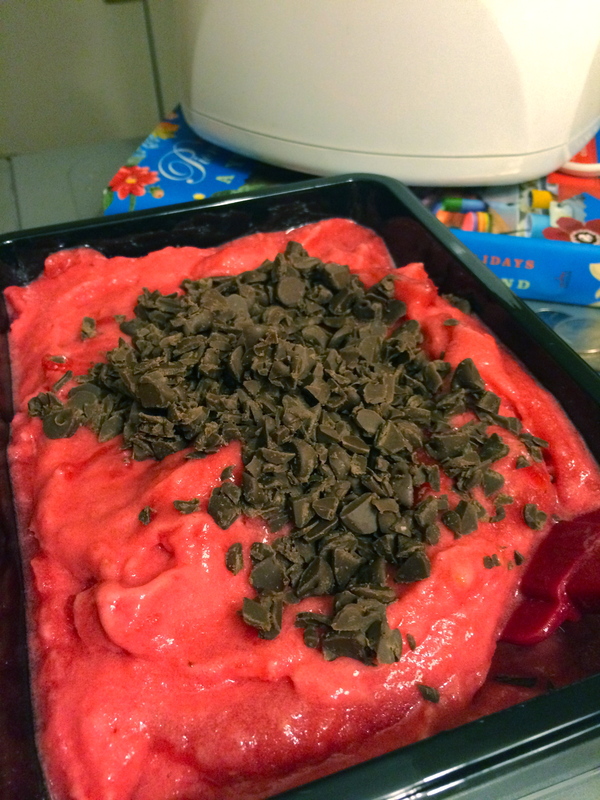 I didn’t actually keep track of how long I churned the sorbet for – it was less than one full episode of LOST…around 25 minutes, probably. 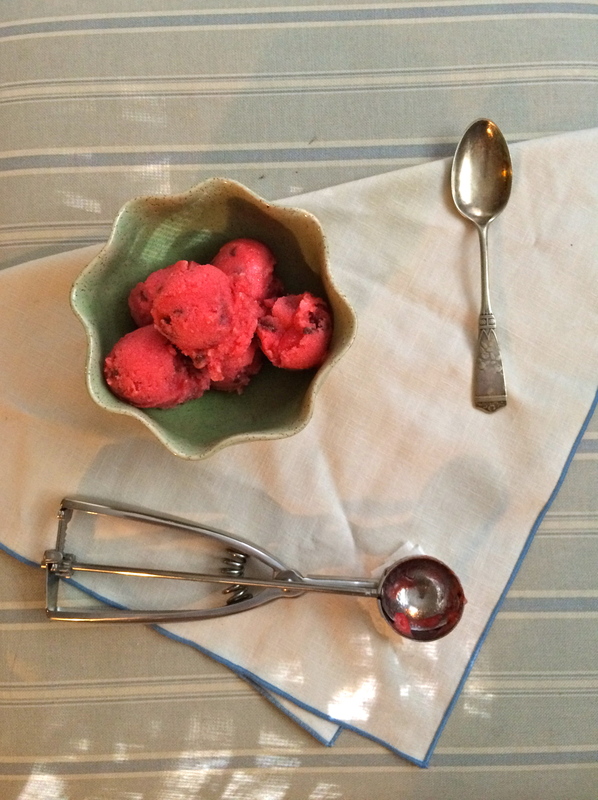 When the sorbet is thick and churned, it will have a “soft serve” consistency. Pour it into the container you’ll be freezing it in, and stir in the chocolate chunks. Freeze a few hours or overnight.